Does your dog bolt as soon as you take him off leash? Do you dream of your dog coming to you when called? Our Advanced Training is available to dogs of all ages who want both on and off leash training. Using state of the art tools and techniques our trainers will not only provide a foundation of basic skills but also more advanced off leash obedience. After your dog’s initial training we provide ongoing support for your dog’s lifetime. Call us or come by our dog training facility in Petaluma, CA. 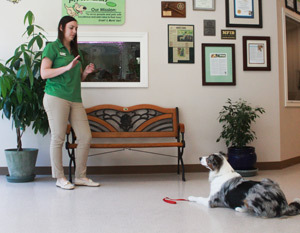 In most cases, your dog will stay with us during training. This 'doggie boot camp' approach often provides quality, longest-lasting results. Of course, our boot camp features pampering in our accommodations as well as training. Each doggie student enjoys their own colorful, clean, comfortable and climate-controlled room and the attention of our loving, certified staff.